Plan to spray herbicides under power lines is widely opposed on Cape and Vineyard. 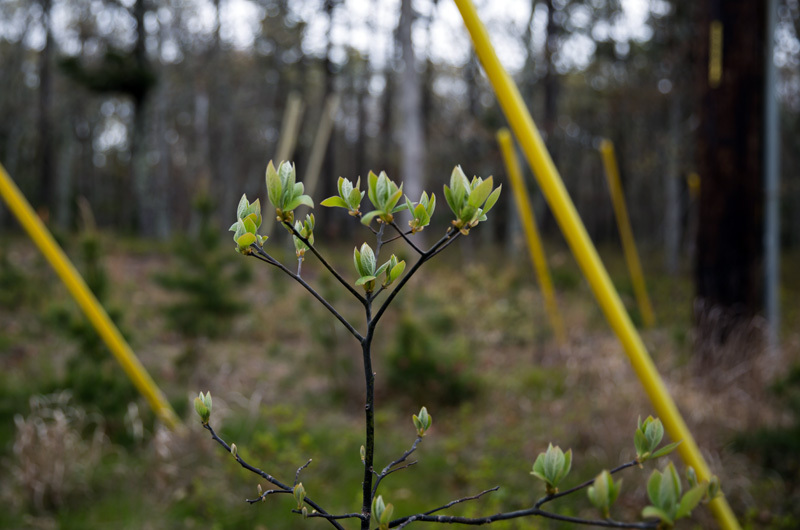 The Tisbury selectmen voted this week to go to court against Eversource Energy to try to block the planned spraying of herbicides under power lines this fall. The selectmen voted unanimously Tuesday night to have their attorney seek a temporary restraining order against the utility giant. “The community has really spoken very loud and clear on this issue at every meeting I have attended regarding this. We are definitely hearing that they would like this to stop and other alternatives be looked at,” said selectman Melinda Loberg. Tisbury selectman Tristan Israel agreed. Tisbury is following the lead of the town of Brewster, which was granted a preliminary injunction in Barnstable superior court last Friday, temporarily halting herbicide spraying. The order remains in effect until Nov. 1. Brewster has fought for years against the use of herbicides to control vegetation. In the latest rounds, that town has appealed Eversource’s permit application to the state department of Agriculture, and has separately filed a complaint in court claiming negligence and breach of contract because the spraying is near an aquifer. Under state law, spraying must take place at least 50 feet away from a private well. Brewster town attorney Bruce Taub argued that all wells get their water from the aquifer and the aquifer is less than 50 feet from the surface. At the Tisbury selectmen’s meeting on Tuesday, town health agent Maura Valley said the Vineyard aquifer is similarly shallow. “In most instances on the Cape and the Islands, the aquifer is less than 50 feet deep, so they are not meeting that separation,” she said. Eversource Energy’s 2017 operational plan for the Cape and Islands targets 17 rights of way in the region, including West Chop and Edgartown-Vineyard Haven Road. Ms. Valley said she had been informed the sprayings would begin in two to three weeks. Attempts to contact the company that does the spraying about when they will be on Island and what chemicals they will use have gone unanswered, she said. The use of herbicides by Eversource has been widely opposed on Vineyard, with town selectmen, the Martha’s Vineyard Commission and the Vineyard Conservation Society all speaking out against it and writing letters to the state agriculture board. Cape and Islands state Sen. Julian Cyr has filed a bill on Beacon Hill that would give communities more control over local spraying decisions. The Cyr bill and several related bills were referred last January to the Senate-House Joint Committee on Environment, Natural Resources and Agriculture. No hearings have been scheduled. Eversource spokesman Michael Durand this week defended the management program, saying it effectively promoted habitat and service reliability. He said according to a study by the state Department of Agricultural Resources, the Eversource spraying program accounts for less than one per cent of herbicide use on the Cape. In 2009 Eversource adopted a four-year moratorium on spraying. This year a Cape group that included two Vineyard residents had petitioned the state pesticide board for a one-year moratorium. In late August, the board voted not to consider the request because the Brewster appeal was already in process, with an adjudicatory hearing set for Oct. 13. But by then the spraying, which typically begins in late September, would be over. On Tuesday Tisbury selectmen vowed to join the court action. Speaking to the Gazette by phone, Mr. Taub said towns should be looking ahead to Eversource’s management program for next year — and that there is strength in numbers. “As far as I’m concerned, the focus of every town should be on the 2018 vegetation management plan, and the more towns that cooperate in the effort to block spraying as a part of the 2018 VMT is the most effective thing that they can do at this point in time,” he said. Edgartown selectmen this week stopped short of joining a court action but said more information about the spraying is in order. In a reversal from the previous week, the selectmen decided to send a letter to Eversource after conservation agent Jane Varkonda said she had learned that not only Roundup (glyphosate) was on the list for possible use but also two other lesser known herbicides. Meanwhile, on Tuesday Tisbury planning board member Ben Robinson suggested the town take an even broader look at the issue, noting that home use of herbicides such as Roundup is common. Martha’s Vineyard Commission executive director Adam Turner also attended the meeting, but could not say if the commission would pursue legal action against Eversource. “We are looking as the commission as to what our responsibilities are, and what our powers are. We have different statutory responsibilities and powers than towns, but we do have significant environmental powers,” he said. Tisbury resident Stephen Power voiced concerns. The selectmen said they also plan to explore a home rule petition to regulate herbicides that could lead to an article for the spring town meeting. Mrs. Loberg said the town should take the long and short view. “The very nature of the restraining order gets public conversation going about the impact of all of this pesticide and herbicide stuff,” she said. Alex Elvin and Steve Myrick contributed reporting. Bravo Tisbury! It's time to stand up to power companies who are only concerned with their bottom lines and shareholders' returns over the public they are supposedly in business to serve. Will you complain when the aquifer is contaminated and wells on the Island become unusable? Say no to spraying... they are just being lazy, they can cut and clear AND not endanger our islands water. Say no to spraying! "Round up" has recently been sited as an causal agent for Non Hodgkin's Lymphoma. As a cancer survivor I am very concerned about this product or similar products for use around private homes or commercial use by the electric company. It will endanger the island and put residents at risk. A big thank you to the town of Tisbury Selectmen for going to court to block the planned spraying by Ever Source. THANK YOU Tisbury Selectmen for standing up for your towns people!! Why doesn't Eversource rent goats to clear the shrubbery? Probably less expensive and certainly more effective. Last time they used kerosene as a spray adjuvant . My understanding is that the outdoor temperature needs to be about 100F for kerosene to completely evaporate . On top of that if we have rain within 24 hours after the spraying it gets washed into the soil and makes it's way towards our wetlands . Now tell me this is all benign .